Fig. 4. (A) Superposed structures of monomeric CaHINT and LmHINT colored in salmon and light blue. 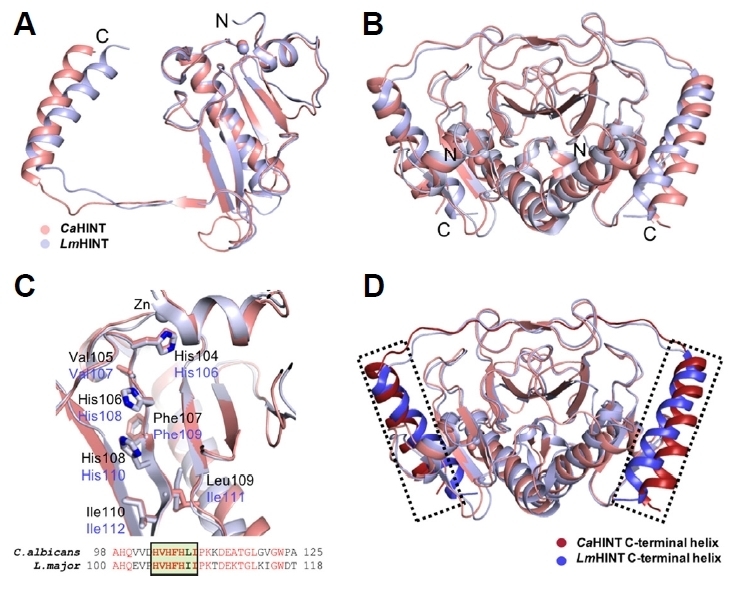 (B) Superposed dimeric structures of CaHINT and LmHINT are shown in the lower right portion. (C) Detailed view of the superposed histidine triads from CaHINT and LmHINT. Compared sequences including the histidine triad motif are indicated in the lower panel. Identical residues are show in red. (D) Superposed dimeric structures of CaHINT and LmHINT. The extended C-terminal helices of both structures are highlighted in red and blue, with dotted boxes, as indicated in the lower right of the figure.